Organizations are losing millions of dollars a year to unskilled Internet searches, aimless social media posting and poorly curated or hard-to-find information. Lynn Epstein, InfoDesk COO, will participate in a panel discussion entitled "Moving Beyond Aggregation: The New Wave of Content Curation Tools" at the upcoming Special Libraries Association’s 2016 Annual Conference and Info-Expo (SLA 2016) in Philadelphia. InfoDesk will also exhibit at SLA 2016, which will run from June 12-14. The panel discussion, presented by the Information Technology Division and the Competitive Intelligence Division, will be held Tuesday, June 14, 11:00 AM - 12:00 PM. Learn more and add to your show planner. The session will examine the increasing demand for more carefully curated content in the workplace. Among the many discussion topics, Epstein will address how information professionals can calculate the real costs of information overload in the workplace and how innovative content curation and delivery tools can save time, increase awareness and raise information ROI. In fact, InfoDesk estimates that such wasted effort costs organizations $833 per minute in lost productivity for every 1,000 information users they have. (The estimate assumes an average pay rate of $50 per hour for fifty weeks per year). Even the most conservative estimates suggest that the average information user spends a minimum of two hours per week looking for information. By that calculation, the cost to multinational corporations and other large organizations (with tens of thousands of employees) is literally staggering. “The good news,” said Epstein, “is that a new breed of content curation and delivery tools is disrupting this wasteful pattern.” Not only that, based on these same calculations, organizations with 1,000 employees that adopt these new tools can save more than $1 million per year in lost productivity for every five minutes they save their employees. The panel discussion is intended to help information and competitive intelligence professionals understand the new breed of content curation tools available to help them sift through the ever-increasing flow of published content and social media. The panelists will explore the challenges surrounding information usage, as well as discuss real life examples of how some top companies and other organizations are tackling these challenges. Joining Epstein on the panel will be Zena Applebaum, Director, Competitive Intelligence at Bennett Jones LLP and Past-Chair of SLA CID. The panel will be moderated by Dorothea Salo, IT Division Conference Planner. InfoDesk will also be exhibiting at the SLA 2016. Conference attendees are invited to stop by tabletop Exhibit 4 to speak with the InfoDesk team and see how they can do more with their content resources, including content curation, drug pipeline, competitive intelligence, and much more. 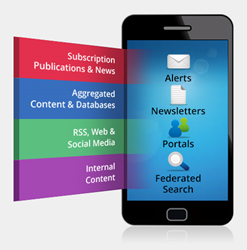 InfoDesk helps organizations integrate, manage and share all of their information resources on a single “content neutral” platform. InfoDesk has been providing actionable intelligence to multinational corporations, government agencies and other organizations since 1999. InfoDesk is based in New York with offices in London, Washington, DC and India. Learn more about InfoDesk.